We were watching the Royal Wedding ... and when I saw the Queen I grabbed my camera, lol. Now that's Mellow Yellow. Everyone do the royal wave. That was one of the nicest outfits she's had for a long time, and I've been watching her for a long time. I remember seeing her when she was still a princess. I just loved her outfit. She looked so radiant. Happy Mellow Yellow Monday. Thanks for hosting! Nice colour for a Royal Wedding. actually, Her Majesty's simple yellow garb was my favorite among any other guests. She looks so happy. Happy MM. Yep, she's wearing a perfect dress that day. Looks so happy and bright! She's pretty, isn't she? Very nice outfit she have too! Have a great Monday! Cheerful like a canary ! nice yellow. :) The queen looks a lot like her mother did. Always good with TV - you can see all you want! He he he! How funny! Bravo! I think everyone is so gaga about this royal wedding..
What a catch in yellow. It really was a very elegant wedding, with the exception of some of the hats! Cute. Happy Monday! I almost did the same thing. Thankfully, I took a photo this weekend or we would have been all matchy-matchy with our posts. Happy color to wear on a beautiful day for a lovely wedding! I always love the queen's outfit and wearing yellow during the Royal Wedding made herself looked prettier, of course next to the bride..
An icon of elegance! My entry is up! She looked lovely, didn't she? Yes, waving at you from Seattle. The grand old lady does look so very happy, and such a good color. 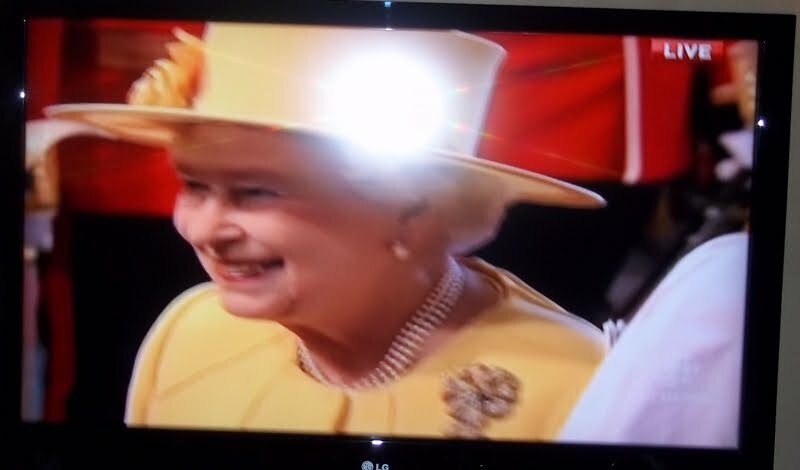 I bet she is a happy queen :) Loved her yellow outfit during the royal wedding. She looked pretty and received a lot of complimentary reviews with her yellow. This is my first time to join in. Thanks for hosting. Yellow is a happy color they say. Queen Elizabeth the second had a good dress on. Love it. Can't find nice dresses like that anymore..
she looks more beautiful with that simple but very elegant outfit! I just loved the queen in yellow. One of the best dressed by far at the wedding. She looked to lovely! Thanks for hosting Mellow Yellow Monday - I'm just a little slow!